Blondie and Brownie: Vendys 2012: Can We Pick 'Em or Can We Pick Em? •Foodie “Meet-and-Eat:” Eat, drink, and hang out with some of this year’s celebrity judges and well-known foodies, including judge and Food & Wine Magazine Restaurant Editor Kate Krader, Zach Brooks of Midtown Lunch, and Ed Levine from Serious Eats. •Street Food Mini-Tours: Turnstile Tours will be offering a mini-version of their regular food cart tours, featuring an up-close and personal experience with two of this year's nominees. VIPs will meet the owners, hear their stories, and learn some tidbits on the history of street food in NYC. All, of course, while sampling the delicious cuisine. •Cooking Demos: BlondieandBrownie.com and MidtownLunch.com bloggers, Siobhan Wallace and Alexandra Penfold (hey, that's us! ), will demo a refreshing slushie cocktail recipe from 2010 Dessert Vendy winner Kelvin Slush for their upcoming book New York a la Cart: Recipes and Stories from the Big Apple's Best Food Trucks (Running Press, Spring 2013). Good for admission to the Vendy Awards. Copious amounts of food and wine. Each ticket is a tax deductible donation. 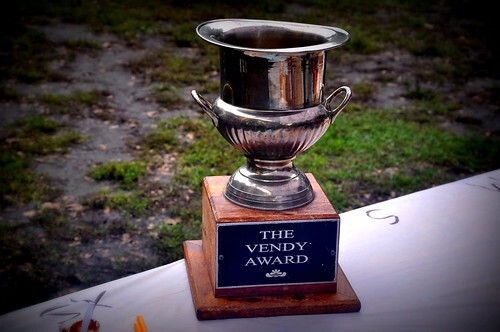 Early Entry ticket buyers are entered into a lottery to become our "Citizen Judge," eat at Judges Table, and help choose our 2012 Vendy Cup winner. Limited Time Only, While Supplies Last. If you're already bought your ticket you can upgrade to VIP for only $50 more. And the money goes to a great cause, The Street Vendor Project and their advocacy for vendors rights. So what are you waiting for? Go get your tickets now! Wow!! What nice info on this post!All information really useful.I love your stuff very much.Thanks for sharing this helpful post.